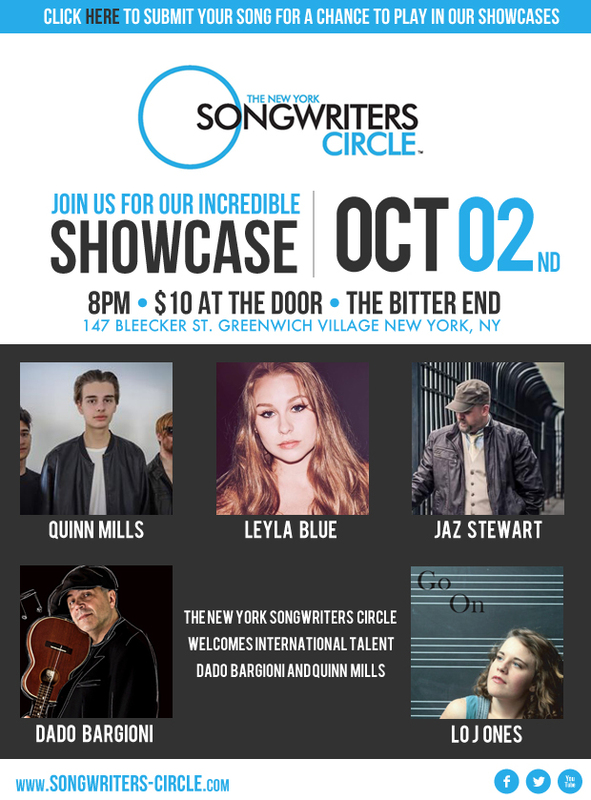 Leyla Aroch – is an 18 year old New York native who travels around NYC and Los Angeles performing her original songs. Obsessed with r&b and hip hop, she blends the two genres with her pop/singer-songwriter roots, and is currently working on her first release. She is so excited to be here at the songwriter’s circle for the 2nd time! Through his emotional songs and honest storytelling. He is most comfortable in his own skin when writing, singing and playing music. He’s also excited to be here for his 2nd songwriters circle. Quinn Mills – is a 17 year old singer-songwriter from Toronto, Canada. He released his first single “James Dean” last summer and will be releasing his next single “Take It” on April 11. Mills is signed to a publishing and management deal with MP Music House of New York and Nashville. Lo Jones – is a passionate composer, drawing influence all the way back from ‪Claude Debussy‬ to today’s best of the singer-songwriter world. She aggressively delivers delicate soul to her audience while slyly lacing her songs with complex harmonies and form. She was raised a small-town girl but is now taking NYC by storm, simultaneously bearing her gifts and downfalls on her arms through the power of song. Dado Bargioni- italian singer/songwriter & music-therapist. As a freelance author he collaborates with SUGAR, one of the most important record labels in Italy. Over the years, his songs have become part of many soundtracks for TV and cinema. In these days he is completing his fourth album with his new band (DB4 +). Meanwhile they are already touring with their show around the Italian and European clubs, to promote it.